Antarctica. Your Fois Gras is OUT. What to do? Now for something completely different….. Antarctica does funny things to people. Executive Chef Lothar Greiner is no exception. I snapped this shot after a formal portrait session on the sea ice edge near Mawson’s Historic Hut in Antarctica. An Adelie penguin was running between the both of us and it only took one glance to do the obvious. With a twinkle in… Lothar’s eye he knew exactly the perfect pose to strike! 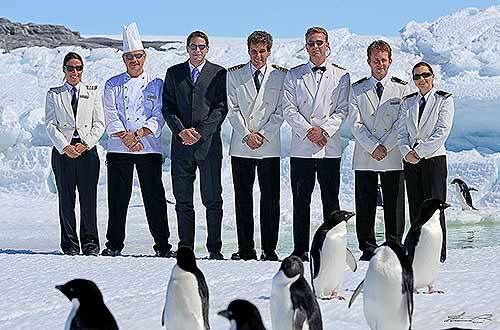 Lothar is the Executive Chef on Orion Expedition Cruises which takes in the Ross Sea and Mawson’s Hut areas of East Antarctica. Amazing what he and his team can produce in the galley onboard a ship in big southern ocean swell. A very resourceful man (as the photo shows ;->), with keen sense of humour. Lothar and his wife Tracy (#1 and 2 below) are wonderful people, oh, and they used to live in NZ and owned a fine restaurant in Picton so they’re nearly related. Don’t try this at home. 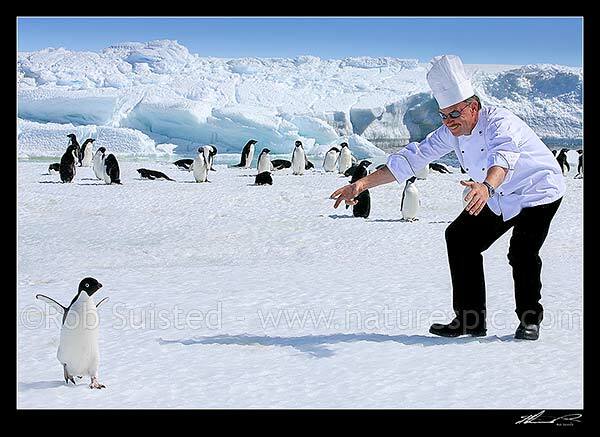 No penguins were hurt, harrassed, or cooked in this photo shoot! Check out the rest of my large Antarctic stock photo collection, there are some beauts (and great memories) here, even if I say so. I was lucky enough to pick up an old copy of North and South and was greeted by fantastic photos (yours!). I’m a keen traveller (Antarctica is high on the list), amateur photographer and professional coffee drinker who likes to have a laugh so your blog is perfect for me. I know I will spend many happy hours looking through your photos. Thanks for the nice words Andrea. ‘Professional coffee drinker’ – nice work. I’m the opposite, a professional photographer, amateur coffee drinker…. That’s serious hardship ;-> I don’t know what is worse, taking methadone instant coffee for a month, or going without entirely? I have a solution…I’m just back from Tiritiri Matangi Island and my first DOC volunteering experience (it was awesome!). I ditched the coffee and replaced it with licorice tea (tastes better than it sounds) and good quality dark chocolate (tastes just like it sounds). The combination of a natural pick me up and the caffeine in the chocolate worked a treat. Plus no need to carry milk and sugar. You're reading Antarctica. Your Fois Gras is OUT. What to do? at Nature’s Pic Images Blog.